Title: Western Marine & Salvage Co. Some of the several designs are commonly named Ferris Designs after Theodore E. Ferris, the official naval architect for the USSB. Ferris designed both steel and wood ships for mass production. One design, 1001, was for wooden 3,500 ton steam freighters with dimensions of approximately 281 X 46 X 23.5 feet (7.2 m) built largely of precut, numbered components of pine or Douglas fir. There were other wooden ship designs, many unique to regional yards, and a large wooden fleet was built, one that has been called by some the “white elephant” fleet. Some were burned in accidents; however others were burned after the war to recover valuable metals. 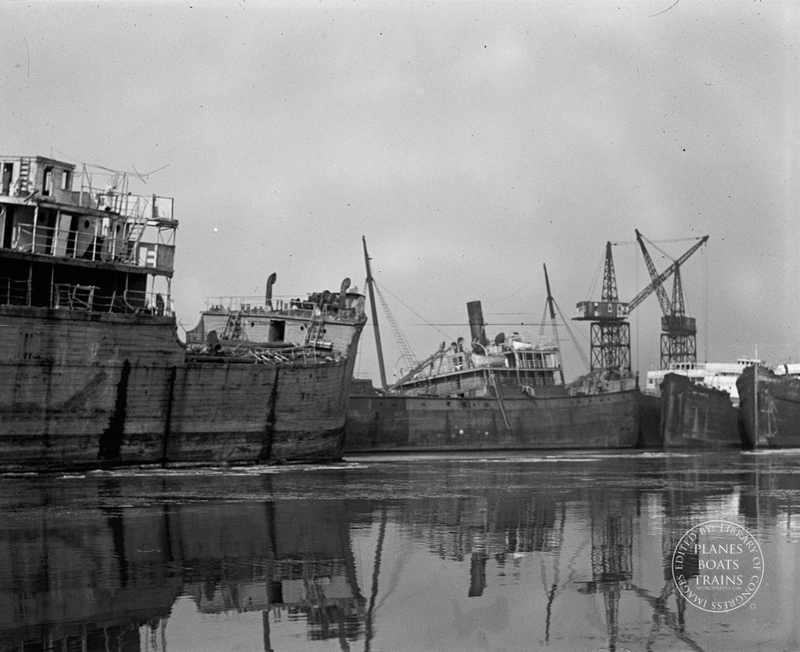 For example, in 1922 Western Marine and Salvage Company (WM&SC) of Alexandria, Virginia bought 233 such ships for $750,000 so that the ships could have machinery removed in Alexandria and then towed back to the anchorage on the Potomac and burned to regain remaining scrap. That activity brought protests from watermen and the operation was moved to in 1924 to 566 acres (2.29 km2) of company owned farmland surrounding Mallows Bay in Maryland.